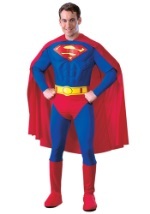 Go from a newspaper reporter to a superhero instantly with this plus size Superman costume! It includes a blue jumpsuit that ties at the back of the neck for closure. The foam, molded chest gives the appearance of muscular definition and proudly displays the Superman logo. A yellow, foam belt tops off the attached red briefs and red boot covers are sewn on to the bottom. A red, flowing cape ties around the neck and completes this superhero costume. Add our black glasses to keep them guessing this Halloween season!